Why should I join TACA? Conferences and Continuing Education: TACA conducts an annual education conference in the Fall, which provides at least sixteen hours of continuing education and focuses on developments in the field and new technologies applied to the trial court environment. Professional Development Programs: In conjunction with the Texas Center for the Judiciary, Inc., TACA provides faculty and program materials for the Professional Development and the Court Management Programs for Texas trial court coordinators, managers and administrators. Scholarships: TACA also provides professional development scholarships to its members pursuing careers in the administration of justice. Publications: The Association publishes the TACA Journal to keep the membership informed of recent developments in the field of court administration, changes in case law that may impact the administrative procedures of trial courts, and programs implemented by local courts. 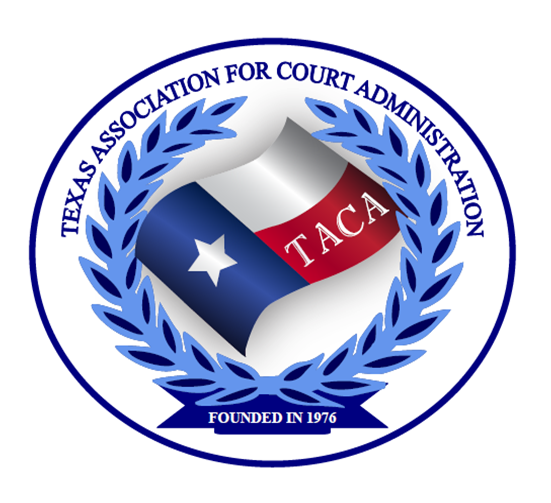 Networking: Membership in TACA provides a link between Court Coordinators and Administrators throughout the State of Texas. Anyone can join TACA. There are different levels of membership to suit each person! Use the form below to start the process. You will be sent an invoice for your membership fee. You will officially become a member of TACA when your membership payment is received. Can I attend the TACA Conferences if I am not a TACA Member? TACA requires membership for attendance at its Annual Education Conferences; however, we make it easy for you - when you register for the conference, we automatically invoice you the conference fee plus one year's membership. Associate - $35.00 (USD) Subscription period: 1 year No automatically recurring payments A person engaged in a related field may become an associate member. An associate member may participate fully in the association including serving as a member of a committee. However, an associate member may not vote, chair a committee, nor be elected to serve on the Board of Directors. Judicial - $35.00 (USD) Subscription period: 1 year No automatically recurring payments A Judge who is interested in furthering the purposes of this organization is eligible to become a judicial associate. A judicial associate member may not vote, Chair a committee, nor be elected to serve on the Board of Directors. Sustaining - $200.00 (USD) Bundle (unlimited) Subscription period: 1 year No automatically recurring payments A person, persons, firm or corporation interested in furthering the purposes of this organization A Sustaining member may serve on committees, but may not vote, chair a committee, nor be elected to serve on the Board of Directors.